I have a cute number card for you today. 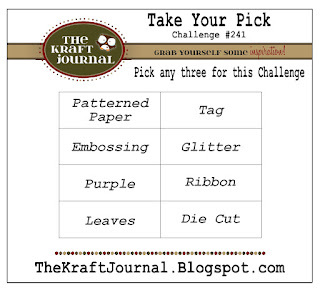 We have the Take Your Pick challenge at The Kraft Journal. Today I created a sweet kids number birthday card picking items from the challenge inspiration. It shows how The Kraft Journal challenge is always open to interpretation. All you need to do to play along is use Kraft or items that can be purchased from The Kraft Outlet. I used Die-cuts, Purple, Ribbon, and Patterned Paper ( and the patterned paper has glitter in it). I started with a card base of Brown Kraft Cover Weight Card Stock onto which I added the glittered patterned paper. Next I took a piece of Buff Ivory Card Stock and cut it to the size I needed and rounded the top two corners. I stamped Happy and Birthday (PTI) in pink and lavender inks adding the die-cut squared chipboard in the middle adding the 8. I die-cut the th (PTI) and placed it to the upper right of the number. I die-cut and stamped some candles (PTI) and placed them on the lower left corner where they would peek out from the Lilac Lace Seam Binding I wrapped around the card front tying in a scrunchy bow embellished with a button (DeNami Design) and Pink Baker's Twine. Lastly, I added a few colorful sequins for an added touch of glitz. Here is the Take Your Pick choices for the week. Fun & festive & beautiful, Tammy! Love how you added the candles! Have a great week! Those candles are so cute!! This is festive and fun Tammy. Sure to make any 8 years old's birthday extra happy! So bright and fun, Tammy! Love the bow and the big number 8, and the scattering of sequins is such a fun touch. Really love the candles tucked into the bow, too!